Avengers: Infinity War (Part I) is blasting into cinemas on May 4, 2018! Totally, man! I give all of the credit to Producer-turned-President Kevin Feige. He is the glue that binds that universe together. I had a chance to interview him for ‘Iron Man 2’ and I stupidly turned off my digital recorder because, before that, I had never gotten any useful information from a producer. What a maroon! Anyway, I saw him later that night at a party and got a chance to talk to him. Brilliant guy! And, yeah, between Star Wars, Guardians 2, Infinity War, Justice League and Spider-Man, it’s almost impossible to keep up with the nooz! Giddy… yep I’ll just say it. I’m down right Giddy after seeing that! Dude what’s your theory about Thor’s latest weapon? The area of it that goes into the bottom right corner is definitely not a hammer. Do you suspect in the movie he becomes unworthy and has to wield a new weapon? @Aubeeno: That would be interesting, but no, I don’t think so. What looks like the start of an axe head or blade (to the right) is actually the leather hand strap. He might be swinging some different weapons in Ragnarok, however, considering it’s a gladiator movie! Totally! Seeing as how the Grandmaster will likely have Thor and the Hulk duking it out, I wonder if as the elders of the universe have a larger role in Infinity War, if in Avengers 4, the Collector will have a Contest of Champions against Mistress Death for life of his brother the Grandmaster (just like that story in the comics). I remember the Russo bros said they don’t want to release the title of A4 because it seems it’ll give away some sort of plot point that A3 has a cliffhanger on. Little fan theory of mine, and unlikely, but would be extremely awesome if it happened. Well, I honestly wouldn’t be surprised by anything anymore. 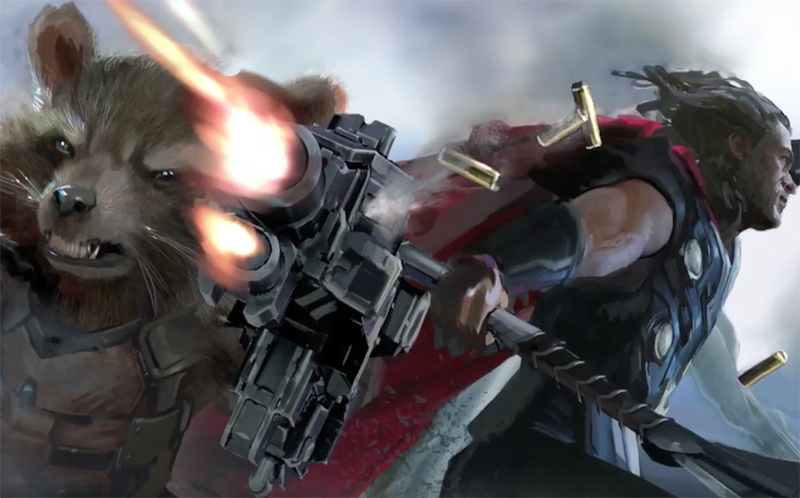 Marvel took a HUGE risk with Guardians and they nailed it. After that, opening up the world of magic with Dr. Strange! They really can do no wrong. Considering the game Contest of Champions is hugely popular, who knows? Mistress Death will definitely be popping up in one or both of the Infinity War movies. Expect massive death tolls. That scene where Tony sees all the Avengers dead at his feet — I’m sure that will happen, just as it did in the comic book series. But, s/he who holds the Infinity Gauntlet can bring anyone back to life!